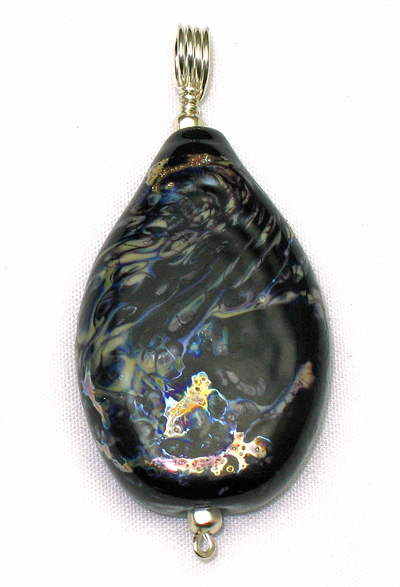 This lampworked bead is a flattened teardrop shape made with dark, transparent cobalt glass, pure silver foil, and ivory glass over an intense black glass base. The interaction of the silver with this combination of glasses provides very subtle and interesting color patterns and sheen. It is designed to be worn as a pendant either on the black satin cord which comes with it or it can be strung on a favorite chain. The bead has a sterling silver wire bale that is approximately 3/16" in diameter ... large enough for most omega and similar chains.